Dongmyo Flea Market started life in the late 1980s. 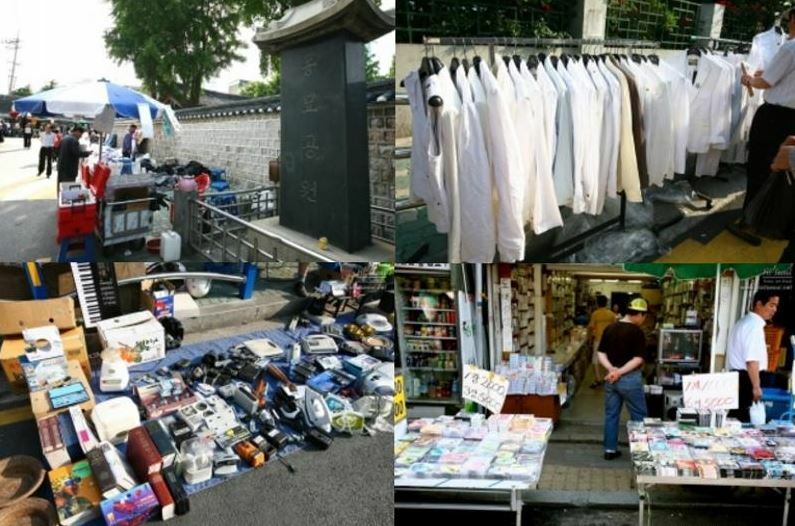 Every day an array of street stalls open up along the stone walls of Dongmyo Park. The main items bought and sold here are antiques of every type, including items such as wallets, electronics, old books, film posters etc. Recently vintage clothing and shoes have become the main area of interest. Prices are typically around 1,000 won so you can have fun browsing and shopping without worrying about the cost. There are all kinds of items from everyday miscellaneous goods to antiques. If you get peckish while shopping, boiled duck’s eggs cost just 1,500 won each or bindaetteok (mung bean pancake) make very satisfying snacks. The market is always crowded with people at weekends. The most popular item in Dongmyo Flea Market is used clothing. When new stocks arrive, the market is packed with people looking for bargains. Prices are normally around 1,000 won, but leather items or furs reach around 10,000 won. Designer labels can reach over 100,000 won. The best time for shopping is on weekend afternoons.